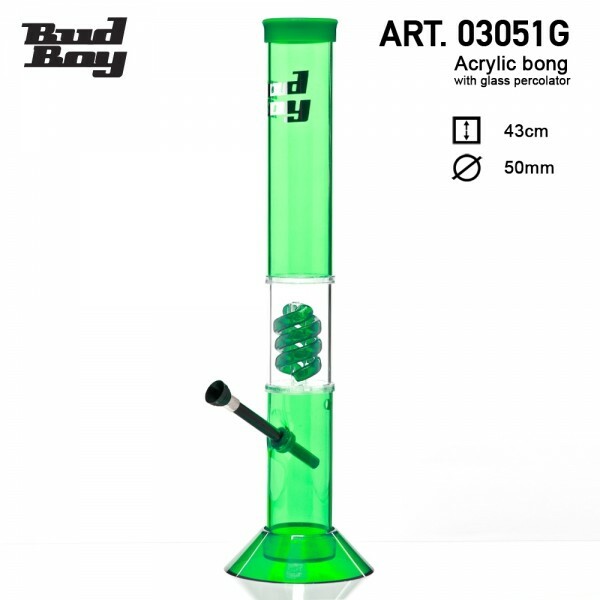 This green Cane Bud Boy Bong is a fine piece of glass artwork made to satisfy your smoking expectations! Formed in the shape of a hollow base tube of 43cm height, it comes with a black bowl, for placing your precious herbs or tobacco. The black bowl connects to a built-in chillum, used for spreading your smoke into the tube, so as to get filtered by the water. A spiral percolator bubbles up your smoke. What's more, a kick hole at the height of the bowl, will offer you the option of enjoying an alternative toke angle! With the Bud Boy logo featuring at the top, the tube ends up in a comfortable mouthpiece ring.